As with all previous editions, this 72nd edition of the Monaco Grand Prix will be subject to a flawless preparation to host the 6th round of the Formula 1 World Championship, scheduled in the Principality from Tuesday, May 22nd to Sunday, May 25th. The Monaco Grand Prix is one of the oldest and most prestigious automobile races, played in the Principality of Monaco on a street circuit designed in 1929. A legendary race around which, for the last couple of years, VanDutch Yachts are partners of the iconic team Red Bull by organizing the drivers and their team to the heart of the stands in Port Hercules. The Monaco circuit slithers around the Port Hercules, in the streets of Monte-Carlo and La Condamine, moving from one tight turn to the next. The narrow track is physically demanding and makes overtaking difficult, however, over the years, the Automobile Club has made continuous improvements to the circuit especially to the pit stops. For the players as well as the spectators, Monaco is undeniably the must-attend Grand Prix ! A world renowned event that should, again this year, bring its share of surprises, thanks in part to the modification of the technical regulations. A revolution has been underway for a few months since the atmospheric V8 2.4L gave way to the turbo V6 1.6L, equipped with more powerful energy recovery systems, which plunges the entire discipline in a new era of hybridization. Sports-wise, a reshuffle has indirectly taken place. It is therefore difficult to predict who will succeed to Nico Rosberg, last year’s winner after 78 laps around the street circuit of 3.34 km masterfully conducted… 30 years after the success of his father Keke in the Principality, not to mention the 2013 fastest lap record held by Sebastian Vettel, on board of his Red Bull-Renault with a timing of 1 min 16 s 577 per lap and an average speed of 157.018 km/h. NTK Marine and the VanDutch Yachts at the 72nd Formula 1 Grand Prix from May 22nd to 25th 2014. 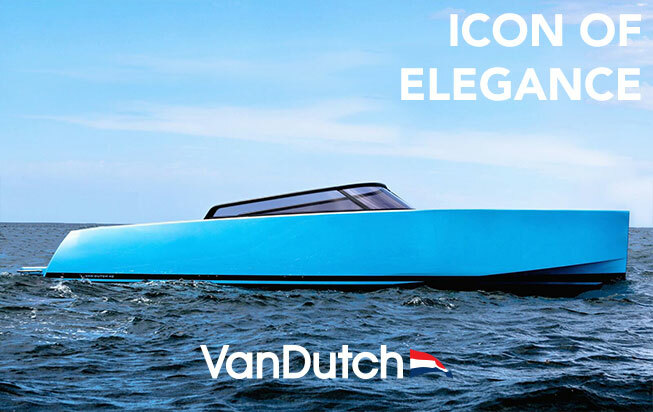 At each Monaco Formula 1 Grand Prix, several VanDutch boats are used by the RedBull Company to accommodate the drivers’ transportation from their hotels in Monaco to the RedBull stands situated at the heart of Port Hercules in Monaco. The VanDutch boats are also here to transport the RedBull team and their guests. Launched back in 1987 by Dietrich Mateschitz, the energy drink with red bulls is experiencing a success story that notably translates in its international expansion, it is now available in 164 countries. More than an energy drink manufacturer, the group became an event-brand. For rental inquiries please contact us.